The Biggest Gold Nugget found in Alaska. 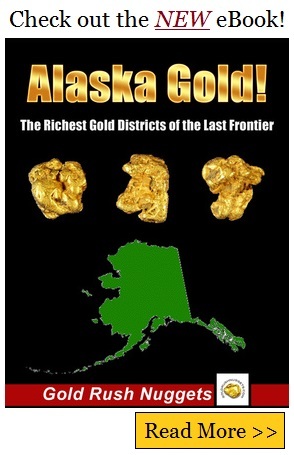 The largest gold nugget ever found in Alaska is named the Alaska Centennial Nugget. It weighs a whopping 294.10 troy ounces, and was found near the town of Ruby, Alaska in 1998. Barry Clay was placer mining an area along Swift Creek that was known for producing large nuggets. He was pushing dirt with his bulldozer when something unusual caught his eye. He jumped out of the dozer and picked up the object. He immediately knew by the weight that he had unearthed a huge gold nugget. He immediately buried the nugget under a nearby tree until he could figure out what to do with it. When he finally took it into town for further examination, it was determined that he had found the largest nugget ever found in Alaska, and the second largest nugget ever found in the Western Hemisphere behind the Boot of Cortez nugget found in Mexico. It was named the Centennial nugget because it was found on the 100th anniversary of the Klondike Gold Rush, which brought thousands of men north to Alaska in search of gold. Its discovery in 1998 shows that there is without a doubt lots of huge gold nuggets left to be discovered. They haven’t all been discovered, not by a long shot! With the record high gold prices in recent years and the renewed interest in gold mining, there is a very good chance that more big gold nuggets will be found in the very near future. Many other large nuggets have been found in the Ruby Mining District as well, including numerous nuggets that weighed over a pound. Alaska has by far the most commercial mining operations compared to other states, mainly due to its miner friendly regulations in comparison to other states. Alaska has a reputation for large nuggets as well. Overall gold produced here is not as high as other states like California and Nevada, but if you want to find a huge gold nugget in the United States, Alaska is the best place to look. Where to Find Gold in the U.S.